Welcome to the Wasteland. 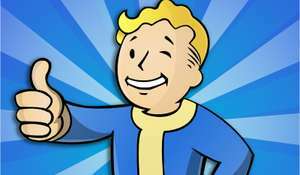 For 24 hours only or while stocks last, grab individual Steam keys for Fallout 3 and Fallout New Vegas in this truly S.P.E.C.I.A.L. Star Deal and save 78%! the 2008 videogame of the year, Fallout 3. Interesting, that's a very novel idea to bundle one of the worst games of …Interesting, that's a very novel idea to bundle one of the worst games of all time with one of the greatest of all time. Interesting, that's a very novel idea to bundle one of the worst games of all time with one of the greatest of all time. Is there a discount on DLC going as well? It's a really good deal but since it doesn't offer any of the dlc for either of the games, I'd probably opt for the slightly more expensive GOTY editions of both to get the full experience. Thanks Buzz. My library is almost complete now. They're right, New Vegas is a masterpiece and 3? Not so much..